In Greece, bread is served with both lunch and dinner, whether you eat in a tavern or are invited to someone’s home. The bread does not only provide an extra flavour, it’s great for soaking up sauces and olive oil. Also, a good bread, some juicy olives, feta cheese and a well-chosen bottle of red wine make an excellent picnic. 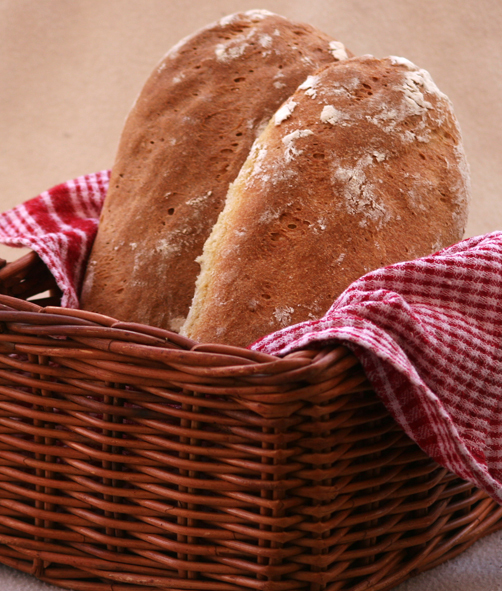 Use the flour you prefer, but a mix of plain wheat flour and semolina gives the bread quite a Greek flavour. If you want, replace semolina with sifted rye flour, for example. A sprinkling of sesame seeds on top is not entirely wrong. Stir dry yeast into the water, yogurt and olive oil. Mix in honey and salt. Knead in enough flour to make a firm, smooth dough. Sprinkle a little flour over the dough. Cover the bowl with plastic or aluminium foil, and place it in the refrigerator overnight. The next morning, remove the bowl and leave it in a warm place for an hour. 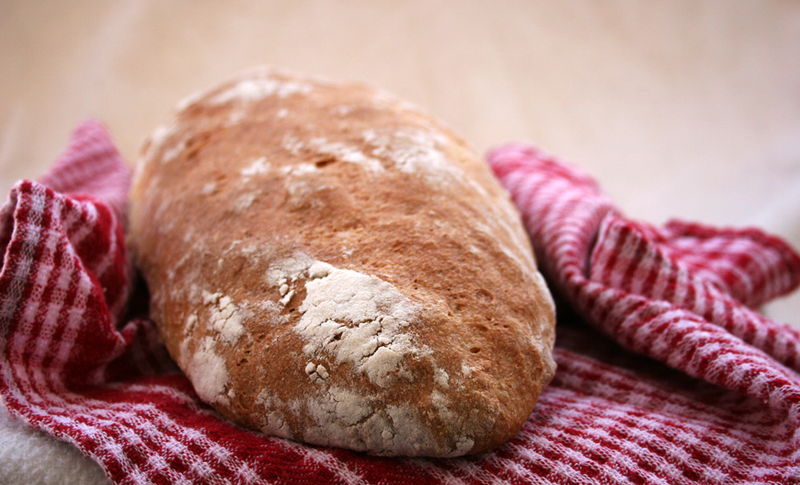 Then divide the dough in half and form two loaves, work as little as possible with the dough. It’s okay that the loaves look really homemade. Preheat the oven to 40 degrees C, and let the loaves rise in there until doubled in size, about an hour. Turn the oven up to 220 degrees C, and bake for about half an hour. You can check if the loaves are done by tapping them on the underside. A hollow sound means that the bread is ready to eat! This old Greek recipe was found written on papyrus in Egypt, and proves that also the ancient Greeks could make great food. Just smell the aromas that spread in the kitchen while it’s cooking! The old recipe doesn’t say anything about amounts, so I’ve experimented to find a dish I like, you can add more or less amounts of whatever you like if you want to experiment further. The original recipe asks for a little anise, I use ouzo, Greek liquor with anise, instead. 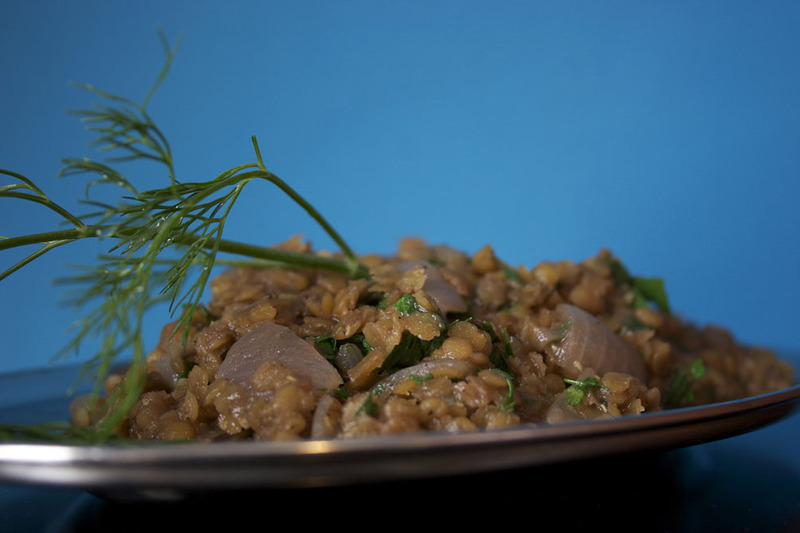 The lentils taste great with white fish or fried chicken, and are also an original mezé dish. Wash lentils. Mix everything except the parsley, salt and pepper, and simmer, covered, until you have a thick stew, about 45 minutes. Add a little water if it cooks dry. Add the chopped parsley and season with salt and pepper. Ladera is a generic term for vegetables (and other foods) cooked in oil, and this is really traditional fare. Ladera is eaten all year, but is especially popular during Lent, when many Greeks don’t eat meat. 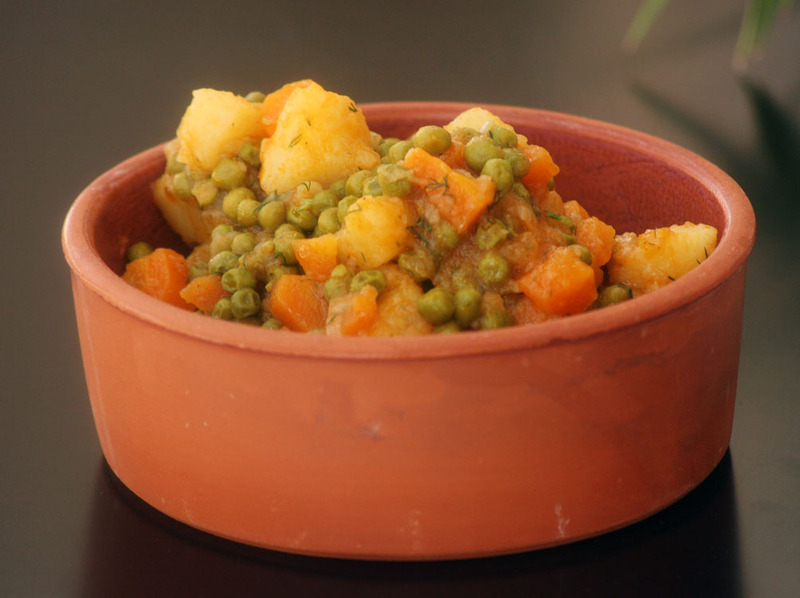 Peas, carrots and potatoes, like in this recipe, are common in a ladera, as are artichoke hearts, peppers, tomatoes, beans – depending on what is in season. One, two or three vegetables cooked together and eaten, often as a main dish, in company with feta cheese and bread. But the ladera can of course also be served as an accompaniment to meat or fish. Dill is often used as spice, but especially with mint, peas are more than usable, and parsley goes with more or less everything. 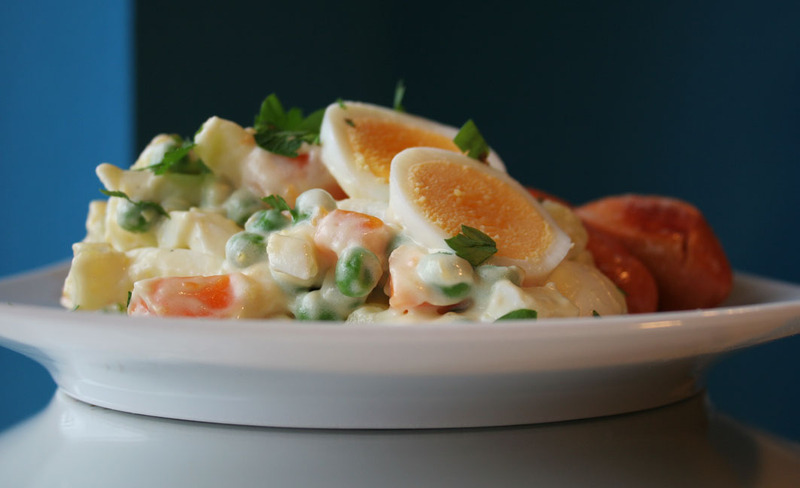 The recipe below is just a starting point, experiment with different vegetables and herbs. I add quite a lot of water and thus less oil when I cook ladera, to limit the number of calories. If that’s no problem for you, simply use more oil, less water, and the ladera will be even better. Also be aware that the ladera should cook quite a while, in other words, the vegetables will be really soft – over cooked some will say. But that’s the way it should be. Heat oil and fry the onion so it becomes soft but not brown. Add the rest, except dill. Simmer for 45 minutes under a lid, stirring occasionally. Add the dill. 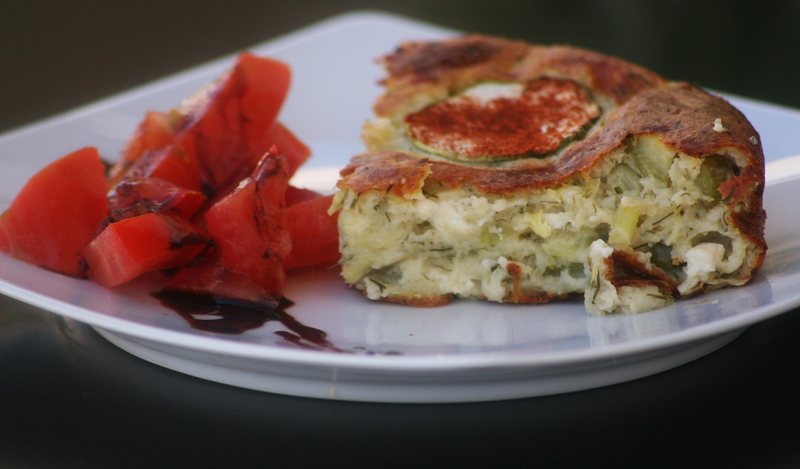 Eat the ladera warm or lukewarm, with bread and feta. For 2 as main course, 4 as a side dish. Squash pie, zucchini cake, I do not know exactly what to call this heavenly mix of squash, leek and cheese, but the name isn’t really important when it comes to good food. Directly translated kourkouto means something like (cake) batter. Eat the pie / cake as an main course, along with a fresh tomato salad and a piece of bread, or as an accompaniment to grilled chicken. The recipe is borrowed from the fantastic Greek food blog kalofagas, but with a few changes, the most important being that I use more cheese in my kourkouto. For nothing is much better than cheese. And by the way, if you want you can fry some bacon and add to the batter before baking the pie. Seriously good! Sweat leek and squash (except slices) in oil for about 15 minutes. Meanwhile, make the batter: Beat eggs; add flour and baking powder, then yoghurt. Stir well and add the cheese, along with dill. Stir in the vegetables. Season with pepper and paprika, the cheese is probably so salty that you do not need a lot, if any, extra salt. Pour into a greased, small baking dish. Top with the squash slices, sprinkle a little paprika on top, and bake at 175 degrees C for about 50 minutes. Let the pie / cake stand fifteen minutes before you eat it, but if you wait until it has room temperature, it’s absolutely fine too. To 2 as main course, 4 as a side dish. 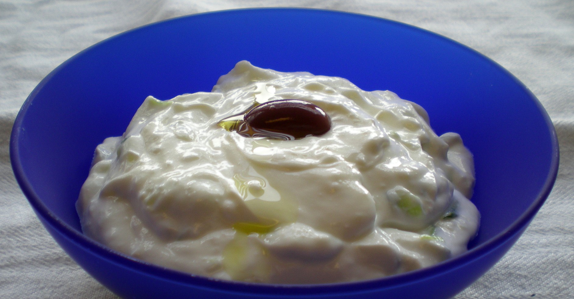 * Kasseri is a lovely, tasty but not strong, Greek cheese made from sheep’s or goat’s milk. If you are lucky you have a fantastic cheese shop near you, to find an adequate replacement is not easy. However, provolone, cheddar or graviera will probably also taste excellent in this dish. 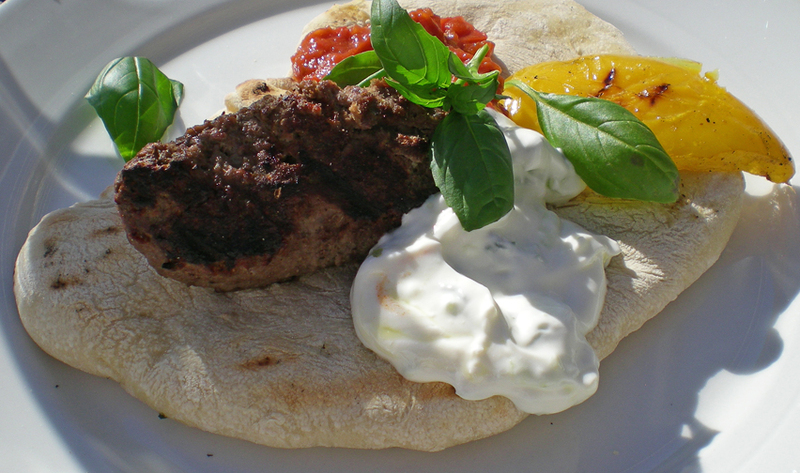 A pita bread can be rolled around some grilled meat, tztatziki and tomatoes, eaten with a stew, or be served like the photo shows, topped with meatballs, tzatziki, grilled peppers and a tomato sauce. Knead the dough lightly on a floured worktop, and divide it into 16 pieces. Roll each piece into a ball. Sprinkle a little bit of flour on top of the balls, and use a rolling pin or your hands to stretch and flatten the dough into thin, round cakes of about 12-13 cm in diameter. Place them on an oiled baking tray. Leave to rest while you heat your oven to 275 degrees C.
Bake for 4 minutes, or until the pitas rises and colours slightly. Leave to cool on a wire rack, under a kitchen towel. Potatoes are a natural part of a Greek dinner and on the mezé table, either baked, like here, or as fries. I got this recipe from Panos, so I have named it in his honour, but this is a common way to bake potatoes, they become soft and velvety inside and a bit crispy on the outside. If necessary, peel the potatoes. Cut them into chunks or boats. Mix the rest of the ingredients in a bowl, add the potatoes and stir well. Pour everything in an ovenproof dish. Bake under foil for about 1.5 hours at 200 degrees C. Increase the temperature to 225 degrees C, remove foil and bake further, until the potatoes begin to brown. This is probably one of the most famous Greek dishes. It’s also delicious and very easy to make. Serve with roasted or grilled meat and fish, as a dip, on a mezé table… It keeps for a few days in a closed container in the fridge, so feel free to make a big portion. Grate the cucumber and squeeze out as much liquid as you can with your hands, preferably with the help of a few flakes of paper towel. 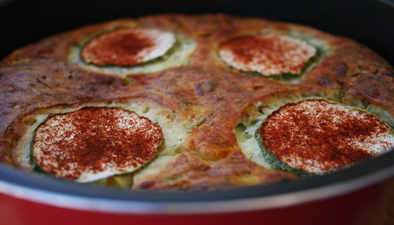 Mix cucumber and yogurt, garlic, olive oil, and if you like, finely chopped dill or mint. Let the tzatziki stand for at least half an hour, or longer. Stir in some salt just before you eat. Do you want the tzatziki to look totally authentic, place a single olive in the middle of the dish and drizzle with a little olive oil. Wash peas well. Add them to the boiling water, remove the foam. Add olive oil and bay leaf. Cook for at least one hour and 15 minutes under a lid, over low heat. Add more water if it’s getting dry, and stir frequently. The consistency should be like porridge, and the split peas partially cooked to a mash. Season with salt and pepper. For extra velvety Fava, us a blender or food processor. 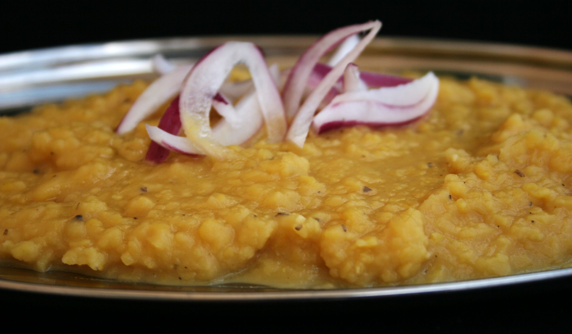 The puree is usually served with some red onion on top, and possibly capers and a splash of olive oil. Ideally, a skordalia is made in a large mortar. And there are as many recipes for skordalia as Greek housewives. Some use both potato and bread, either vinegar or lemon juice, more oil than this recipe, less oil than this, fish stock and lemon juice instead of vinegar, the garlic amount varies, some add finely chopped walnuts … Skordalia and deep-fried cod is a common (and heavenly) Greek combination (see photo). The skordalia can also be served with other kinds of fried / grilled fish or meat, or boiled beets. The potatoes must be well cooked and really soft. When they are lukewarm or cold, peel and mash them, whether in a mortar or food processor. Be careful when using the food processor, over-pureeing could make the potatoes sticky, like glue. Crush garlic with a little salt in a mortar. Mix this with the potatoes, and gradually stir in the oil, then water. (If you need water, that is, it depends on how much water the potatoes contain in the first place.) The mixture should be smooth and soft. Season to taste with lemon juice, vinegar, salt and pepper. Allow the puree to rest for a while, to develop more flavour. Skordalia can be kept for many days in the refrigerator. Serve cold. Skordalia can be made with bread instead of potatoes. Use old bread, preferably several days old. Remove the crust, cut the bread into slices. Soak slices in water for 10 minutes, squeeze out as much water as you can, and proceed as above.